Are you a tradesperson on the lookout for a new commercial vehicle? Or a company wanting to add some smart new vans to your company fleet? Don’t want to compromise style or comfort for yourself or your drivers? Then it could very well be that the Fiat Ducato 3.0TD is for you. 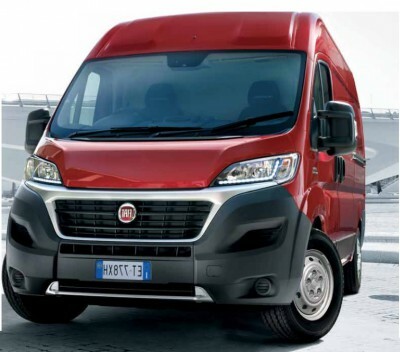 The Fiat Ducato 3.0TD could be the vehicle for you even if you aren’t a tradie or a company fleet manager. This roomy van has tons of potential for doing whatever you want to with it. Courier vans, campervans, mobile coffee vendors… you name it, the Fiat Ducato 3.0TD can probably do it. There is one exception here, however: if you’re a large family looking for a people-mover, this isn’t the Fiat for you. This is because the Fiat Ducato 3.0TD is designed to carry loads rather than people, and has seating for three. In the back, there is lots of room. A whole massive 15 m3 in the XLWB version, 13 m3 in the LWB, 11.5 m3 in the high-roof MWB, 10 m3 in the low-roof MWB and 8 m3 in the SWB, to be precise. The Cab Chassis version, of course, is the stripped down version that just screams out to be customized – your imagination and the expertise of your local engineers are the only limits here. Size is the only thing that really differs among the six variants of the Fiat Ducato 3.0TD. All of them are fitted out with the same powerplant, which is a 3-litre multijet turbodiesel that delivers all the get up and go that you are likely to need: 130 kW of power and a very juicy 400 Nm of torque (perfect for towing if you need to add a trailer to increase the carrying capacity of the Fiat Ducato 3.0TD even further). This engine is hooked up to the front wheels via a six-speed transmission, which can either be manual or Fiat’s Comfortmatic robotized automatic system. The Fiat Ducato 3.0TD is no speed freak, with a top speed of 171 km/h in the small SWB and 160 km/h in the XLWB; however, that’s fast enough for what it needs to do. Fuel consumption (a big consideration for those weighing up the possibilities of the Fiat Ducato 3.0TD for a company fleet) is 8.9 L/100 km combined in the bigger versions and 7.7 L/100 km combined in the wee SWB – and you see worse fuel consumption in a lot of passenger cars that can’t take anywhere the Fiat Ducato 3.0TD can. The Fiat Ducato 3.0TD may be able to seat the driver and two passengers only, but they’ll be able to travel in style and comfort. This may be a working vehicle, but it hasn’t compromised on comfort or on safety. All of the seats, including the middle seat, have proper three-point seatbelts and airbags, which, alongside the electronic stability control package, will help keep all the occupants safe and sound. The stability control package includes ABS braking with EBD, Hill Holding and a couple of very welcome features for a big van like this: load-adaptive control and roll-over mitigation. We all know that heavily laden vehicles handle differently from your regular little sedan or sports car, so it’s good to see some van-specific safety features being designed these days. Other comfort features that will be appreciated by all occupants of the Fiat Ducato 3.0TD include the manual air conditioning, the 5-inch touch-screen radio that features Bluetooth preparation (a must for a tradie who’s always on the road), CD player, USB input, auxiliary socket and steering wheel mounted audio controls. The dashboard-mounted refrigerated box (which works when the air con is on) will also be very welcome to tradies who pack a lunch and want something cold in the middle of a hot day. The driver will enjoy the cruise control, the rear parking sensors, the electric door mirrors, the heated rear window and the armrest and lumbar support on the driver’s seat. The Cab Chassis version has fewer bells and whistles, given the pared-down nature of this type of vehicle, so it leaves off the rear parking sensors, the heated rear window and the third rear brake light. This is simply because all these features are part of the load compartment, which the Cab Chassis hasn’t got. Everything else is the same. When it comes to getting loads in and out, the Fiat Ducato 3.0TD has been properly set up with doors that open to 270°, so you won’t have any hassles with doors getting in the way when lifting out something bulky. The under-roof shelf also comes in handy for putting little bits and pieces, and you’ll find this as a standard feature on the high-roof MWB, the LWB and the XLWB Fiat Ducato 3.0TD variants. In the looks department, the Fiat Ducato 3.0TD is about as far away from a boring white box as you can get. It simply oozes Italian style in spite of being a work van. Yes, you can get a white version (a perfect blank canvas for a logo) but it also comes in three shades of blue (one of which is metallic), red, metallic black, two shades of silver and metallic “golden white”. You can go for plain old steel wheels, but you can also opt for some striking-looking 16-inch alloys (the SWB gets its own style). The Fiat Ducato 3.0TD has a bold appearance that makes it look like it means business, and has enough features (black bumper and door mirrors, wee bits of chrome here and there) to keep it interesting. And the overall styling is pure Fiat: the distinctive “squircle” styling has been used everywhere – in fact, a van like the Fiat Ducato 3.0TD can use this shape even more than the “regular” Fiat vehicles. For any more information on the Fiat Ducato 3.0TD, or for that matter any other new car, contact one of our friendly consultants on 1300 303 181. If you’d like some fleet discount pricing (yes even for private buyers! ), we can submit vehicle quotes requests out to our national network of Fiat dealers and come back with pricing within 24 hours. Private Fleet – car buying made easy!